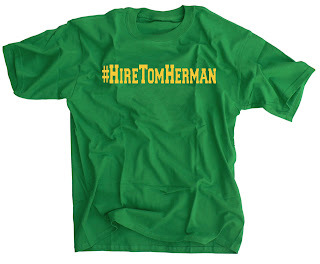 Buy the official "Hire Tom Herman" Shirts Here! You asked for them and now you can get them in your favorite school colors. #HireTomHerman shirts are a statement. You will no longer tolerate being average. Your college football program deserves the best and the best in the business right now who can be hired is Tom Herman. Show your support for Tom Herman with this classic #HireTomHerman shirt. TCU revealed their "special" black helmets they will wear this week vs Oklahoma. While I'm not a huge fan I'm sure the Horned Frogs recruits and players will love them. More importantly they would love a win with them wearing the black lids. What can't Philadelphia Eagles rookie QB Carson Wentz do? Wentz not only has the Eagles 3-0 while playing almost flawlessly he went back to his home state North Dakota and got himself his first buck. Whether it's on the gridiron or in the open North Dakota fields Wentz doesn't miss an open target. I was one of the first of many to doubt Tim Tebow and this whole pursuit of a baseball career. But in his first at-bat and even the first pitch he saw Tebow took a fastball and knocked it over the left centerfield fence. I don't care who you or what competition you are facing that's impressive. Maybe Tebow does have a chance to make the Mets in the future and not just keep himself in the reality spotlight. Not much has changed 4 weeks into the season with our top 5 including the leader at the top of the watch list. 1) Lamar Jackson, QB, Louisville - A week after the statement game vs FSU saw Action Jackson again put up insane numbers vs the Thundering Herd of Marshall. 7 total touchdowns (5 passing, 2 running) pushed his total season to 25 which is more than every team in college football except one. He gets another chance to widen his Heisman lead this week in Death Valley with College Game Day there. 2) Christian McCaffrey, RB, Stanford - Not a great game for McCaffrey vs UCLA in primetime after being hyped up all week by ESPN on all platforms. He didn't score a TD for the first time this season but still managed to rush for 138 yards in a huge come-from-behind victory vs UCLA. McCaffrey will get a chance to prove himself yet again in a primetime matchup vs Washington, a top 10 oppenent, on Friday Night. 3) Donnel Pumphrey, RB, San Diego State - Bye week for the nation's leading rusher. 4) J.T. Barrett, QB, Ohio State - Bye week for the Buckeyes as they prepare themselves for Rutgers. 5) Greg Ward, QB, Houston - Completed 20 of 26 passes for 289 yards and added another 39 yards on the ground plus another TD in a 64-3 win vs Texas State. Ward only played 3 quarters and is still nursing a bum throwing shoulder. This season Browning is completing over 70% of his passes with 14 TDs and only two turnovers. He leads all PAC 12 QBs in passing efficiency and will get to throw his hat into the top 5 Heisman watch list with a big game Friday night vs undefeated Stanford. 7) Patrick Mahomes, QB, Texas Tech - Bye week for the Texas Tech gunslinger. 8) Deshaun Watson, QB, Clemson - Reluctantly I'm putting in Watson in the top 10 list even though he hasn't earned it this season. Watson is by far having his worst collegiate season and if you look at his progression his numbers have gotten gradually worse from his dynamite freshman and sophomore seasons. But he's still the QB of the undefeated Clemson Tigers and led them to an impressive road win vs Georgia Tech. This week he gets a chance to shine as Louisville and Lamar Jackson come to town looking to knock them off for the ACC conference and Heisman watch list lead. 9) Myles Garrett, DL, Texas A&M - Didn't get a sack but he had a key fumble recovery and a huge tackle for loss in a statement win vs Arkansas for the undefeated Aggies. He leads the Aggies in tackles for loss and sacks. 10) Jabrill Peppers, LB, Michigan - As long as Michigan stays undefeated and Peppers is returning punts he will stay in the top 10 list. He wasn't outstanding defensively by any means vs Penn State but he was 5 yards away from a punt return for a TD because he tripped over his own feet. This week he will get to move up the list with a big game vs undefeated and top 10 team Wisconsin visiting the Big House.